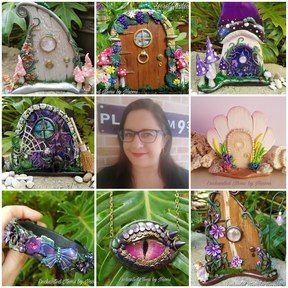 The door has individual swirled seaweed strands, with a shell step to the pretty Mermaid entrance... with shimmers and sparkles to entice the Mermaids to visit. This door can be placed anywhere inside or outside. Attach it to a tree trunk or against your home to give the allusion of a special magical entrance. The door is weathered protected but recommend to use in under cover areas. Can also be placed indoors on a shelf, a base of a wall, above the light switch... anywhere you would like to lure the Mermaids and Fairies to visit. Just place Blue Tac or a 3m wall strip to attach the door. Size of this door is approx. 8cm heigh x 8.5cm wide. These doors are not a toy and not suitable for children under the age of 3years old/adult supervision is required.